Kickboxing ) refers to the sport of combining the grace and style of boxing with kicking. Kickboxing is a standing sport and does not allow continuation of the fight once a combatant has reached the ground. Kickboxing is often practiced for self-defense, general fitness, or as a full-contact sport. In the full-contact sport the male boxers are bare-chested wearing shorts and protective gear including: mouth-guard, hand-wraps, 10-oz. boxing gloves, groin-guard, shin-pads, kick-boots, and optional protective helmet (usually for those under 16). The female boxers will wear a tank top and chest protection in addition to the male clothing/protective gear. In European kickboxing, where kicks to the thigh are allowed using special low-kick rules, use of boxing shorts instead of long trousers is possible. 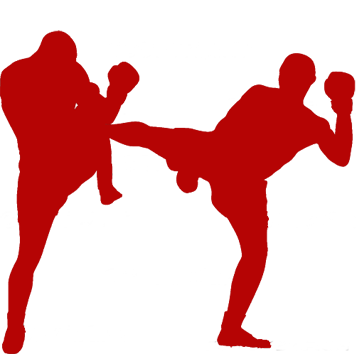 here are many arts labelled kickboxing including Japanese kickboxing, American kickboxing, Indian, Burmese boxing, as well as French savate. The term kickboxing is disputed and has become more associated with the Japanese and American variants. Many of the other styles do not consider themselves to be 'kickboxing', although the public often uses the term generically to refer to all these martial arts. The term kickboxing was created by the Japanese boxing promoter Osamu Noguchi for a variant of Muay Thai and Karate that he created in the 1950s. The term was later used by the American variant. When used by the practitioners of those two styles, it usually refers to those styles specifically. * Adithada (Indian kickboxing) A form of kickboxing that uses knee, elbow and forehead strikes. * Lethwei (Burmese kickboxing) Traditional Burmese martial arts of which has now grown into a popular kickboxing event with strong emphasis on knee, elbow strikes and headbutt. Any part of the body may be used to strike and be struck. It is also known as Bando kickboxing. * Pradal Serey (Khmer "Cambodian" kickboxing) Possible predecessor of Muay Thai with an emphasis on elbow techniques. * Gwon-gyokdo (Korean kickboxing) that is a mix between Muay Thai and Tae Kwon Do. * Muay Thai (Thai boxing) Traditional Thai martial art of which has now grown into a popular kickboxing event with strong emphasis on knee and elbow strikes. * Muay Boran (Ancient Boxing) – Predecessor of Muay Thai, allows the use of headbutts. * Japanese kickboxing Similar to Muay Thai, but different point system is taken. The first fighting style to adopt the name of "Kickboxing". * American kickboxing Similar to Japanese kickboxing but not allowed to kick below the waist. * Savate (French kickboxing) – Allows the use of shoes. * Sanshou/Sanda (Chinese kickboxing) The applicable component of wushu/kung fu of which takedowns and throws are legal in competition as well as all other sorts of striking (use of arms and legs). * Shoot boxing – A Japanese form of kickboxing which allows throwing and submission while standing, similar to Sanshou. * Yaw-Yan (Filipino kickboxing) Sayaw ng Kamatayan (Dance of Death) is the proper name for Yaw-Yan, a Filipino martial art developed by Napoleon Fernandez. The art resembles Muay Thai in a sense, but differs in the hip torquing motion as well as downward-cutting of its kicks. * Draka (Russian kickboxing) similar to shootboxing, using kickboxing techniques with sambo throws and takedowns. * Zen Do Kai Kickboxing Singapore, founded by Peter A. Robertson, developed from Australian Soke Bob Jones Zen Do Kai Freestyle Martial Arts, a combination of Goju Ryu, Shotokan Karate and Muay Thai. There are many additional derivatives of these forms, as well as combined styles which have been used in specific competitions (e.g. K-1).